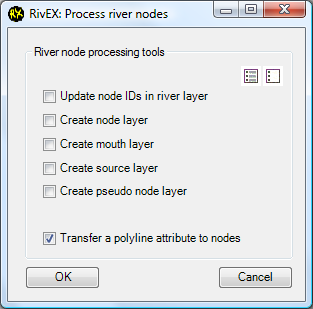 •You can transfer attributes encoded into the river network to anyone of the node layers created by RivEX. Tick the Transfer a polyline attribute to nodes and click OK.
•The transfer attribute dialog appears. Select 1 or more relevant attributes and the layer to transfer to. 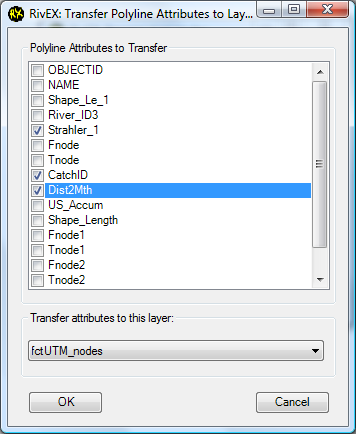 In the example below the user is transferring Strahler order, catchment ID and distance to mouth values to the nodes layer. 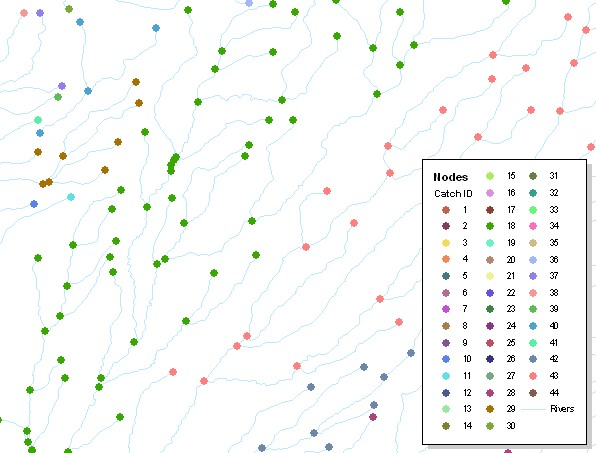 •The node, mouths and sources layer must all have been generated by RivEX as the node ID numbers relate to the node fields in your river network. When RivEX attempts the transfer it will look for specific field names so to use a dataset generated by an alternative method will result in failure. •Once the transfer has completed you will have a new field in your point layer with the same name as the input field. If a field exists already with the same name a new name is chosen with a suffix of "_X" where X is an incremental number. For example the next available field name for CatchID would be CatchID_1. •You can now visualise the new field by colour coding your data. In the Image below the network nodes are colour coded with their new catchment ID field.